Apple Cider Vinegar: No Home Should Be Without It! Raw apple cider vinegar, along with coconut oil, diatomaceous earth, and a few other things, ranks high on my list of simple, all-natural, easy to use and inexpensive health aids. It has so many uses and benefits (just see the chart below!) that no pantry or medicine cabinet should be without a bottle, and if you don’t believe me, just read on…. Vinegar has a long and illustrious history. It’s been traced to Egyptian urns as far back as 3000 B.C., and even Hippocrates, the father of medicine, used it to treat his patients. The Babylonians used vinegar as a condiment and preservative, while Julius Caesar’s army used it in a tonic to stay healthy and ward off disease. The Greeks and Romans kept vessels filled with vinegar for healing and flavoring, and in Biblical times it was used as an antiseptic and healing agent—it’s even mentioned in the Bible. Christopher Columbus and his crew brought along barrels of vinegar to prevent scurvy on their trip to discover America. And for centuries the feared Samurai warriors in Japan drank it for strength and power. But the vinegar that appears on most dinner tables today is a far cry from what our ancestors used for staying healthy. Just as salt has been refined and “purified” over the years to such an extent that it no longer possesses any of its health-giving components, the same is true of vinegar. In fact, the most popular vinegar in supermarkets today is actually a clear, white version created by a food chemist from coal tar!! And because uninformed consumers often buy with their eyes, i. e. what “looks best,” most people purchase this poor imitation of the real thing, or one of the distilled vinegars which have no real nutritional value. People buying with their eyes don’t know what they’re missing, because natural (un-distilled), organic, raw apple cider vinegar (ACV) is one of nature’s most perfect foods. And health pioneers Paul and Patricia Bragg made it part of their life’s work to re-educate the public about its many values. One of the main reasons raw, unpasteurized ACV is so good for you is that it contains cobweb-like substances called “the mother,” which can, unfortunately, make the mixture look not only cloudy, but downright unappetizing to people with its floating “globs of brown stuff” at the bottom. Some people might even mistakenly think that it’s a sign the vinegar has “gone bad,” when actually just the opposite is true. Distilling not only destroys “the mother” and powerful enzymes, but also removes life-giving minerals like potassium, silicon, and trace elements. The distillation process also destroys the natural malic and tartaric acids, which are important in fighting body toxins and inhibiting unfriendly bacteria. So distilled vinegars are basically just flavoring agents and nothing more. Wow! That’s quite a list for something so inexpensive and simple to use! I also read recently where ACV can be used to treat Lyme Disease, something that showed up early on when I first started having some health tests done. The protocol mentioned was to use 1 to 3 tsps. of the vinegar with 8 oz. of water and drink the mixture 3 times a day, before meals. You can use room temperature or hot water, and add a little honey to “soften” the taste. ACV can also be used as a mouthwash, to help relieve constipation, improve memory, alleviate “brain fog,” and much more. * TIP: If you drink distilled water over a period of time (something I don’t recommend doing), it can leach vital nutrients from your system. Adding some ACV to it can help rectify the situation. And for those of you out there interested in shedding some pounds, you will be happy to know that ACV helps with that, as well. Since it naturally supports your body in getting rid of excess fluids, and works to speed up a slow metabolism and “curb” your appetite, you’ll have yet one more reason for adding ACV to your daily health regimen. This “miracle in a bottle” also makes a great first aid treatment on burns of any kind. Just splash some on the affected area to help stop the pain and also prevent scarring and infection. Here’s an excerpt from an article by nutritionist, herbologist and homeopathic practitioner John Summerly of Prevent Disease that mentions some of the conditions ACV can treat and the science that backs that up…. Diabetes. The effect of apple cider vinegar on blood sugar levels is perhaps the best researched and the most promising of ACV’s health benefits. Several studies have found that vinegar may help lower glucose levels. For instance, a study (White, A. Diabetes Care, November 2007) of 11 people with type 2 diabetes found that taking two tablespoons of apple cider vinegar before bed lowered glucose levels in the morning by 4%-6%. In another study from Arizona State University, subjects took a drink of 20 grams of ACV and 40 grams of water. Those with insulin resistance who drank the vinegar had 34% lower postprandial (after-meal) glucose compared to controls. Vinegar may be the most cost-effective medicine in history, but most people with diabetes still aren’t taking it. Cancer. A few laboratory studies have found that vinegar may be able to kill cancer cells or slow their growth. One study found that eating vinegar was associated with a decreased risk of esophageal cancer. Another associated it with a decreased risk of bladder cancer. In recent trials, pectin, which can be found in ACV, has shown promise in helping to slow the growth of cancerous cells within the prostate (http://www.news-medical.net/news/20100702/Modified-Citrus-Pectin-holds-promise-against-prostate-cancer.aspx). In addition, apple cider vinegar’s acidity aids in detoxifying and cleansing the digestive tract and cleaning out the colon, which supports the health of the prostate as well. AND ACV can clean almost anything in your house. Just add liquid castile soap, high quality water, and essential oil (optional) and you have an environmentally-friendly mixture for cleaning floors, the bathroom, kitchen, etc. ACV can also be used as a fabric softener and in the wash cycle to prevent fabrics from fading. Try vinegar and water as a non-toxic way to clean windows, but be sure to use a micro fabric cloth for wiping, instead of newspaper, which can contain toxic dyes. And you can help keep your drains unclogged by sprinkling some baking soda down them, followed by ACV. Let the mixture bubble for 15 min., then rinse with hot water. Baking soda and ACV also make a wonderful spa-like bath for soaking away aches and pains and detoxing the body. It’s almost hard to believe that something so simple and inexpensive could have so many benefits and uses! No home should be without it! Teeth: Did you know that apple cider vinegar can help remove stains from teeth? Rub teeth directly with apple cider vinegar and rinse out. PERSONAL NOTE: I would be careful with this one since ACV is acidic and could damage tooth enamel. In fact, I would recommend that whenever you drink or use ACV in the mouth that you always rinse immediately with pure water. Drain Cleaner: Baking soda and apple cider vinegar is an amazing bubbly combination that has many uses. As a drain cleaner, sprinkle baking soda down the drain, then add apple cider vinegar and let it bubble for 15 minutes, then rinse with hot water. This is a safer alternative to dangerous drain cleaners. And here’s a post that mentions a number of ways to use ACV around the house….including getting rid of fruit flies! 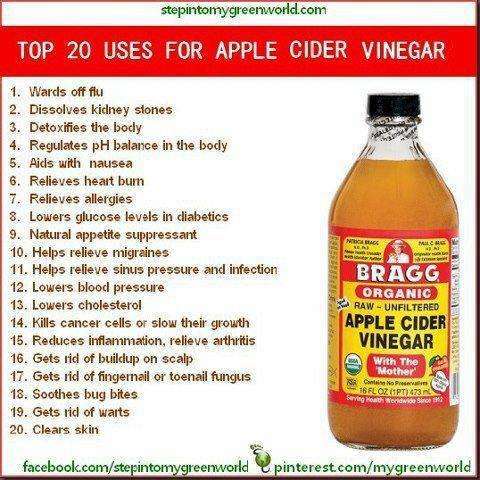 Apple cider vinegar is a natural antibiotic and antiseptic that fights germs and bacteria inside and outside the body. It’s been known to help with PMS and menstrual cramps, morning sickness, skin problems, chronic fatigue and more. It’s also a good heartburn or upset stomach remedy. Many people think that too much acid is what causes heartburn, but it actually occurs when there isn’t enough of the right kind of acid to digest food properly. Most over-the-counter antacids appear to help, but the relief is usually temporary and they leave the stomach more alkaline, which ends up aggravating the situation. Apple cider vinegar is rich in acetic and malic acids that increase the acidity of digestive fluids, causing them to flow faster, which results in improved digestion and assimilation. Apple cider vinegar (ACV) also contains potassium, which keeps tissues healthy, soft and pliable, and helps eliminate toxins by putting them in solution so that they can be carried out of the body. Potassium is also like a detergent for the arteries and helps thin and cleanse the blood, so this protocol works to relieve heart ailments and high blood pressure. And the natural acids and enzymes in the drink help with rheumatism, arthritis, bone pain and stiff joints, when taken 3 or 4 times a day over several months. Plus, using this drink helps control and normalize weight, can relieve a sore throat, promotes a youthful body and healthy skin, relaxes the nervous system, alleviates stress, and promotes deep sleep when taken before bedtime. Pretty good for something so simple and easy to prepare! Mix the vinegar with the honey and, depending on the dis-eases you want to address, drink up to 4 times during the day, or at night before going to bed. The amount of either ingredient can be adjusted for comfort and taste. When apple cider vinegar and honey combine, the chemical formula of each changes. So if you have indigestion or diabetes and are concerned about the acid content of the vinegar or the sugar content of the honey, you may find that the two working together do not produce negative results. A variation of this routine, where you take 2 TBS. of ACV in 8 oz. of water at bedtime, has been shown to moderate waking glucose concentrations in adults with well-controlled Type 2 Diabetes. *Bragg’s makes a raw, unfiltered, organic apple cider vinegar; Dynamic Health, Jarrow and Spectrum are other possible brands to try. **Honey comes from flowers (by way of bees, of course!) and has a very light energy; try to use a honey made from flowers known to provide support for the heart and lungs, if possible, and that’s harvested locally—that way it will help the body build up immunity to allergens common to your particular area of the country. Or, Y. S. Organic Bee Farm honey is a great honey and what I normally use. You can also try substituting coconut sugar (available from Raw Food World and elsewhere), dried sugar cane juice (Sucanat), which is high in potassium, for the honey, and, for variety’s sake, occasionally use mint tea in place of the water. FYI, you can get raw, unpastuerized ACV at discount prices at Vitacost and iHerb, two of my favorite on-line places to shop. And for more information about ACV and ways to incorporate it into your daily health routine, check out the book by Paul C. and Patricia Bragg titled Apple Cider Vinegar: Miracle Health System.